The above rendering shows how a proposed rocky outcropping might look at the revamped Miller Park. POLL: Do you feel safe in Miller Park? Chattanooga Mayor Andy Berke says public feedback has resulted in some new features in a plan to recreate Miller Park. 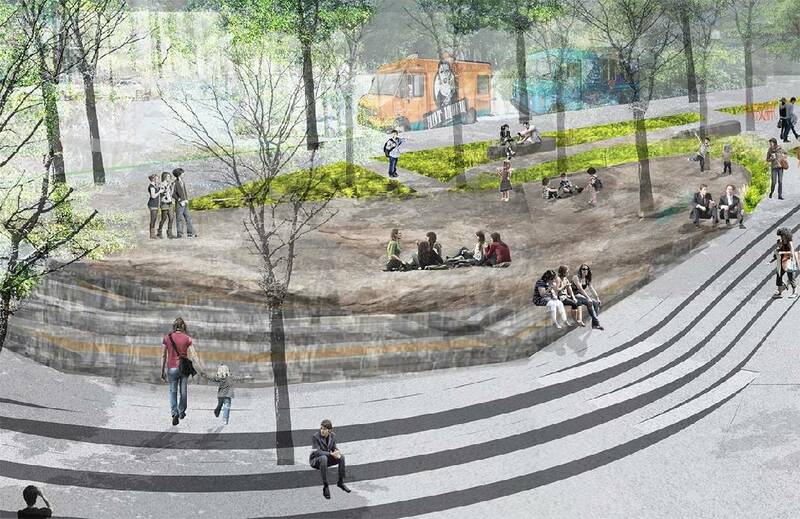 The design for the downtown park now calls for a rocky outcropping in the corner between Martin Luther King Boulevard and Georgia Avenue. It takes the place of a previously planned cafe pavilion. "It's rocks that kids can climb on and walk on and also people can get their food and sit on," Berke said during a recent tour of the park. "This is the highest point of the park, so you'll be able to sit on the rocks if there's a concert playing and you'll be able to see over everybody." While the cafe building was a good idea, people "weren't all that jazzed" about it, Berke said. At that point, designers shifted building resources to improve a planned amphitheater that will run along 10th Street. "We want a home run, not a double," he said. "As we see more people living and working and building a life around this area, we want to give them a place to go. This is in the best tradition of Chattanooga's parks." The multi-use amphitheater will include a shaded place for lunch, a stage for performers or an enclosed space for fundraisers or parties, Berke said. The building design calls for restrooms, a storage area and a warming pantry for food. A glass partition, lowered like a garage door, allows for closed events to benefit from the structure's heating and air conditioning system. Between the amphitheater's glass sides and lighting effects, the roof will appear to hover at night. "It will be kind of cool," Berke said. Other park features include a garden path along Market Street and wide stairs that also provide seating. Matt Busby, director of nearby Camp House, said the community has talked for at least 20 years about redeveloping the park. "My role [in the process] is as an enthusiastic citizen and as someone who has a business in the area and an investment in the area," Busby said. "I'm pretty excited to see it happen." Marissa Bell, spokeswoman for the city's Economic and Community Development department, said the project will go out for bid in October, with groundbreaking expected in November. The city has allocated just under $4.1 million to the estimated $8.1 million project, which includes streetscape changes to create a pedestrian-friendly connection between the park and Miller Plaza, Berke said. Private donations have amounted to $3.5 million, leaving about $530,000 to go for total funding. The Miller Park revamp forms part of a larger M..L King district overhaul, which includes a new look for Patten Parkway. Planners have estimated the whole package to cost $10 million. Berke has called the district makeover a "once-in-a-generation investment" in Chattanooga's future. Contact staff writer Paul Leach at 423-757-6481 or pleach@timesfreepress.com. Follow on Twitter @pleach_tfp.